Awnings are a great way to add an instant touch of color to your home, while providing shade or shelter from the sun, wind and rain. American Awning works exclusively with top brands, including Sunbrella, Dickson, and Eastern Awning, to bring our customers the best possible selection of top quality products. Choose from a variety of different fabrics, colors and styles based upon the decor of your home and the area of your home that your awnings will be installed. Each and every custom residential awning provided by American Awning is designed to make your home more welcoming and inviting, while allowing you to extend your personal outdoor living space. Residential awnings have been proven to help reduce the amount of energy required for cooling and heating, because they help to protect your home from direct exposure to the elements. Well placed window awnings can even lower the inside temperature by up up to 15 degrees all on their own. Residential awnings are designed to give homeowners the ability to enjoy the outdoor areas surrounding their home, regardless of the weather or the season. Awnings can shelter you from the rain one day and shield you from the sun the next. Depending on the style you choose, some awnings are even designed for use in the winter, protecting you, your home and your guests from high winds and snow loads. Aluminum Awnings – These long-lasting, great-looking awnings are custom designed for each and every client. They are extremely durable and are built to withstand just about anything Mother Nature can throw at them. From the blistering sunlight of summer to the intense cold and snow of winter, aluminum awnings are a great asset to any home. Mount one above a doorway for great protection from the New England snow and rain. Fabric Awnings – Easy to customize and great for adding a classic touch of color and texture to any type of structure, fabric awnings are a great and affordable choice for most homeowners. 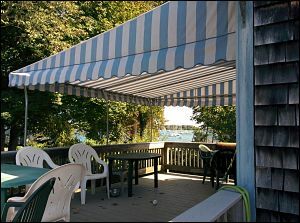 Most fabric awnings are recommended to be taken down during winter months and retracted in advance of major storms. 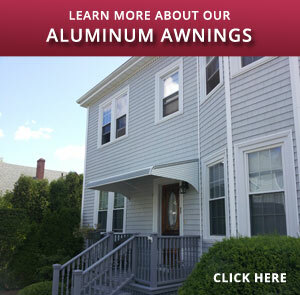 American Awning & Windows takes pride in the work that we do. Paying attention to the level of customer service we provide, the quality products we sell and the team of highly trained installation technicians who work for us, is what helps to set us apart from our competitors. 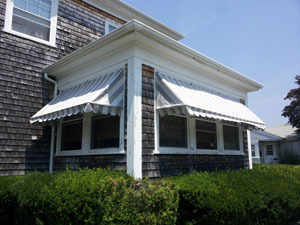 Residential awnings can be used in a number of different ways. They can be installed over entrances and windows or used as canopies over a patio or other outdoor living space. Aluminum awnings are a great choice for use as door hoods, to protect you and your family when you are entering or exiting your home in bad weather. Awnings can also be used over carports, cabanas and even screened enclosures. 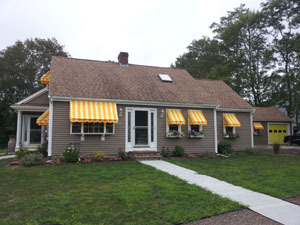 With such a wide variety of colors, materials, brands and uses, homeowners now have more choices than ever before to create a beautiful, yet functional, statement with residential awnings. 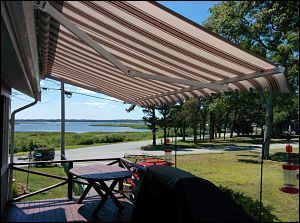 Experience the American Awning Difference! Contact American Awning & Window today for more information on all of the styles, brands, colors and installation options available to our residential customers. Our team of experienced experts can help you choose the best style and type of awning to suit your needs and complement the architectural design of your home. Contact us today at our New Bedford, Massachusetts location by calling 508-995-6333. We can meet with you at your home to discuss your needs and talk about all of the options available, based upon your budget and unique specifications.